One of the best players in the history of Japanese baseball is coming to the majors. 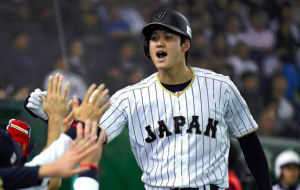 According to reports coming out of Japan, Shohei Otani will be posted by his team, the Nippon Ham Fighters, so that he can join a Major League Baseball team prior to the 2018 season. If true, Otani could become the most sought after free agent on the market this winter, but not the most expensive. The 23-year old Otani is already considered one of the best players in the history of Japanese baseball. Many have called him the Japanese Babe Ruth because of his talents both on the mound and in the batter’s box. As a pitcher, Otani regularly pitches in the mid-90s, but his fastball has been recorded as high as 102 mph. At 6’4” tall, the righty has drawn comparisons to Justin Verlander. Otani also throws a slider, forkball, and curveball. In 140 innings last season, he posted a 1.86 ERA with 174 strikeouts. As a hitter, Otani possesses plenty of raw power and upside. During the 2016 season in Japan, he hit .322/.416/.588 with 27 home runs. He was one vote shy of being a unanimous MVP in the Pacific League. An ankle injury forced him to withdraw from this year’s World Baseball Classic, preventing him from playing on the world stage. However, next spring he plans to play in the world’s best league. Otani will first need to go through the posting system in order to sign with an MLB team. But last December Otani expressed confidence that the Nippon Ham Fighters would let him go when he told them he was ready to play in the big leagues. It’s not surprising that a player with Otani’s talent would want to play in the majors. But his decision to come to MLB right now will cost him hundreds of millions of dollars. Under baseball’s new collective bargaining agreement, there is a limit on signing bonuses for international free agents under the age of 25. If Otani were to wait two years until he turns 25, there would be no cap. Without a cap, it could potentially sign a contract worth close to $200 million based on his market value. Under the current CBA, teams have anywhere between $4.75 million and $5.75 million to spend on international free agents every year. Teams can trade with other organizations to increase the money in their bonus pool. However, Otani won’t be able to receive any more than $10.1 million, and there are only a handful of teams that will be able to offer him that much. The good news for Otani is that he will be able to choose his team. However, his salary will be like any other player getting called up from the minors for the first time. He will make close to the league minimum with three years until he’s eligible for arbitration and six years before free agency. In short, some team is about to get a huge bargain, at least for a few seasons. Clearly, Otani is not doing this for the money. If he spends just two more years in Japan, he could maximize his value on the free agent market instead of having to play three years in the majors just to get to arbitration. But one of the most intriguing international players we’ve ever seen isn’t going to wait. As a result, his selection process when he becomes a free agent will be fascinating to watch, not to mention lucrative for the team that signs him.